Matt Arri with Truman at the Fall 2018 Fall Internship and Career Fair. The new charge from the University of Missouri System to increase employment and graduate school successful outcomes rate to 95 percent for all graduating students by 2023 is a bold goal. And Matt Arri, coordinator of Career Services for CAFNR, is tackling that goal, which is part of the MU Compact launched by UM System President Mun Choi in 2017, head-on. (CAFNR’s current placement rate is 88.3 percent.) Since joining CAFNR just over two years ago, Arri has introduced a variety of new initiatives in CAFNR Career Services. His goal is to make sure students are career ready. One way to ensure students meet these goals is to have them work through a variety of tasks during their time in college, such as creating a LinkedIn account, identifying faculty to write letters of recommendation, and crafting a resume and having it reviewed by Arri and other professional volunteers. Arri calls this the “CAFNR Student Development Plan,” and, although it started on paper, he and colleagues Laura Friedrich and Megan McCauley worked with a development team under the guidance of Bryan Garton, CAFNR senior associate dean and director of academic programs, to turn it into a web application where students can log in and keep track of their progress. The website launched this summer during Summer Welcome. So far, 425 CAFNR students have started their Student Development Plans. Arri has also partnered with the College of Arts and Science to host two joint career and internships fairs over the past year, rather than hosting one just for CAFNR students. Having two colleges with two sets of degree programs means more students and more employers at each event. This fall’s fair was the largest CAFNR has ever hosted, with 155 organizations and more than 1,000 students in attendance. Arri partnered up with A&S after meeting his counterpart there, Julia Parcell, and after taking to heart Choi’s directive to reduce expenses wherever possible during budget issues in 2017. Arri has also implemented an app for the career fair, which shows students what organizations will be attending the fair, and more. Other schools and colleges on campus also use the app, which is provided by Mizzou. It’s a good time to be job hunting as a soon-to-be graduate, Arri said. 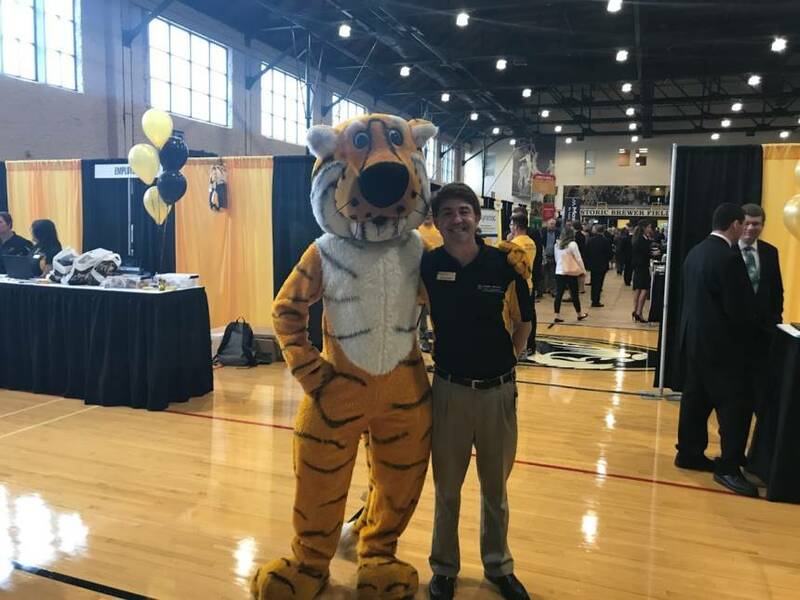 The unemployment rate is low and many employers are always looking to hire Mizzou Tigers specifically. Arri sends postcards and emails to employers, encouraging them to attend the fairs. He also sends postcards to students’ home addresses over breaks, which helps the information get directly into the hands of students – or parents, who are very interested in their children finding employment after graduation, he said. Arri also presents in classes on the importance of the fairs, and has campus covered in signage encouraging attendance. Arri hosted a variety of workshops leading up to the career fair this fall on topics such as budgeting and financial planning, evaluating employers, mock interviews and more. Student turnout at the fall career fair was overwhelming – and there was almost an equal number of freshmen, sophomores, juniors and seniors in attendance. “We’re building a culture of career readiness that begins at Summer Welcome,” he said. “We can’t wait until graduation to talk about career development. It’s all about empowerment. “When the door opens, you have to be ready for the opportunity,” he said. Alumni are key to his success in CAFNR Career Services, Arri said. He encourages alumni to contact him if you would like to partner on projects such as workshops, panels or classroom presentations for students; hosting students as part of an industry tour; or having a booth for their organization at a career fair. Students love talking to other Mizzou and CAFNR alumni, Arri said. He hopes to eventually create an Advisory Board for Career Services, and is always open to exploring other ways to partner with alumni. Contact Matt Arri, CAFNR coordinator of Career Services, at 573-882-0088 or arrim@missouri.edu.